Who’s on the right side of the Libya issue? “Fear Stalks the Streets of Gadhafi’s Capital”; “Rebels Plead for Help.” The two quotes above are from headlines over articles on the front page of the Wall Street Journal on Thursday and Friday. They tell you as well as anything does of the terror that rules Libya. President Obama had first given a morsel of hope to the popular insurrection in Libya by allowing Hillary Clinton to suggest, although ever so tenuously, that America might impose a "no-fly zone" on Muammar Qaddafi's increasingly brutal attacks on the populace. But as days pass, and more and more people—both heroic rebels and just ordinary unarmed folks—are killed, Obama's stalling demonstrates how wary he is of taking a stand against any force in the Arab world regardless of how cruel and murderous it is. His mind is still stuck with the principle that any government in office is a legitimate government whether or not its rule is maintained by force or not. Nor is this just favoritism to Muslims. The United States has barely lifted even a diplomatic finger against Zimbabwe or the "Democratic" Republic of Congo, whose people are as least as miserable as anyone in Yemen—or Libya, and Libya is, by the way, a wealthy country. And, of course, until this late whiff of rebellious hope had wafted through that vast territory stretching from the Maghreb to Mesopotamia, all the regimes in it sustained their power by stepping, as George Orwell put it, on the human face forever. Now, Hillary will say anything that pops into her head or is put there by someone else. "No-fly zone, o.k., no-fly zone." "No, no-fly zone, o.k., no, no-fly zone." But she's already making excuses for why we should not intervene in Libya. You see, she's noticed that there are "opportunists" among the rebels of Benghazi. Opportunists: outrageous. Imagine, here is Hillary Clinton, the spouse of Bill Clinton—no opportunist, he—put off by opportunists and opportunism! We don't really know what they want, she whines. What they want is freedom. Believe me: It is as clear as what you want, Mrs. Clinton. 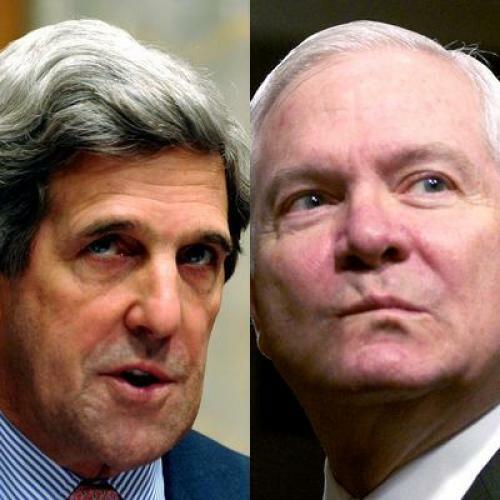 Defense Secretary Robert Gates is actually the administration spokesman for what we will not do in Libya. On Saturday, The New York Times headlined his point of view as "Gates Ratchets Up His Campaign of Candor," as if it were more than just one opinion among others. Candor = Truth right? No. Gates's imminent departure from the Pentagon—this is his shtick: he's always about to leave but when already?—has been deployed as evidence of his impartial wisdom. After all, he'll have no chips in the game. Ipso facto prudent, astute, whatever. The fact is that Gates has, because of his deeply conservative reluctance to expend some little American power with the freedom fighters in North Africa, on the shores of Tripoli, become someone oh-so-sagely quoted at liberal dinner tables across the country. This is a primordial but cumulative moment for these liberals: They can, they will, now turn their backs on anyone and everyone. No matter who the oppressor, no matter who the victim or hero. Gates's timidity is buttressed by the ignorance of the American public. Do we want to get into another Muslim war? After all, there is Iraq, where we still are, though also halfway out. And Afghanistan, into which we are still adding troops, though planning a half-certain exit. But Libya is neither Iraq nor Afghanistan, and its divisions are more tribal than religious. It is true that Qaddafi has had intimate relations with France (shameful relations), with Italy (even more shameful), and with Great Britain (mostly oil-driven economic ties, which led it to the release on fallacious grounds of the organizer of the Pan Am 103 catastrophe in which 270 lost their lives). Midweek, Hillary announced that the Obama administration may look into prosecuting the ruling colonel for the crime carried out in 1988. Pardon me, isn't this a joke? The Africa Command controls many less assets than EUCOM. But troops and materiel can be deployed from neighbors and near-neighbors of Libya. Even CENTCOM has performed rescue missions during the current turbulence, at least in Tunisia. What is being asked of or suggested to the United States, specifically, is that it take out Libya's radar facilities. A grim face on Secretary Gates does not make a chore like this either complicated or hard. Nor is leaving surplus military equipment for the rebels either taxing or perilous. The people of Libya have been brutalized for more than four decades by a psychopathic monster who has mesmerized rough-brained bigots like Stephen Walt. But this monster has evoked little real fraternity on the American political scene. It is true that Senators Joe Lieberman and John McCain were the first to speak up for realistic help to the insurgents and rebels. Almost everybody else was simply calling on Qaddafi to go. Including the president of the United States. An empty gesture. Obama has no credibility with Arab leaders, mostly because he played his first two years in office as their apologists. But, then, Senator John Kerry, the chairman of the Senate Foreign Relations Committee, broke the silence of the Democrats, Lieberman not being thought a Democrat by most other Democrats. Now, Kerry and I have known each for about four decades, first in Massachusetts "peace politics" and then more generally. We were not close, however, and I was not especially friendly. You'll have to wait for my autobiography, which I am not yet writing, to discover the secrets on our rocky road. Either you'll be interested or not. In recent years, however, I have come to respect Kerry enormously. We also had a "really clear the table" dinner one night in Boston, and it did clear the table. As chairman of the Foreign Relations Committee, Kerry saw it as his obligation to help the president whenever he could. I understand that from both patriotic and partisan perspectives. And he took Obama's messages to Pakistan, Afghanistan, Lebanon, and Syria. I know no secrets but I have a sense of what ensued on these multiple visits. Not, by the way, by anything Kerry told me. Still, Kerry is a realist who tries to leaven his point of view with hope for peaceful outcomes. I myself am of mixed minds about what we might expect in Pakistan and Afghanistan, and I miss the wise presence of Richard Holbrooke in that terrible war zone. It is clear to me that Obama hasn't the faintest idea of what's going on in the AfPak region, and is in strategic rescue mode by his commanders who grasp what he cannot. Or refuses to. Lebanon and Syria are an entirely different reality. Obama is lucky that real wars were going on elsewhere so that the utter failure of American policy in the Levant was barely noticed. The president thought he could entice away Bashir Assad, the tyrant-president of Syria, from his links with fundamentalist Iran, and break the historic ambitions of Damascus to dominate Lebanon. He flopped in both, strengthening Tehran, weakening Beirut, and showing Saudi Arabia to be a state the prowess of which is only oil and money. Given the storms around the Arabian peninsula—even Bahrain and Kuwait—the near-nonagenerian and terribly sick monarch, King Abdullah, has been reduced to handing out $36 billion to his own citizenry, if that's what you can call people without political rights, as a bribe to be quiet. After all, Abdullah was to lubricate both the unbelievably corrupt Lebanese and the ever-purchasable Damascenes to distance themselves from Shia millennialism. Kerry's position on Libya is his declaration of independence from the president's fantasy foreign policy. The fantasy is not an ambitious one. It has no poetry and, more important, it gives no hope. Moreover, it doesn't employ power either. Barack Obama has not advanced a single humane cause outside the United States nor diminished autocratic rule anywhere. Neither of these is on his agenda. The president does not believe that America is a worthy doer of good but rather a historically tarnished doer of evil. His blithe but buoyant talk echoes his egotism and pretentious overbearance. The rebels plead for help. They will be dismayed and disillusioned.